On the field, Glenn's cannon arm earned him the awesome nickname "Buckshot." You picture someone like that as all glove and no bat, but Wright regularly cleared .300, first for Pittsburgh and later in Brooklyn. Like Joe Sewell, another top 1920s shortstop, he rarely struck out. 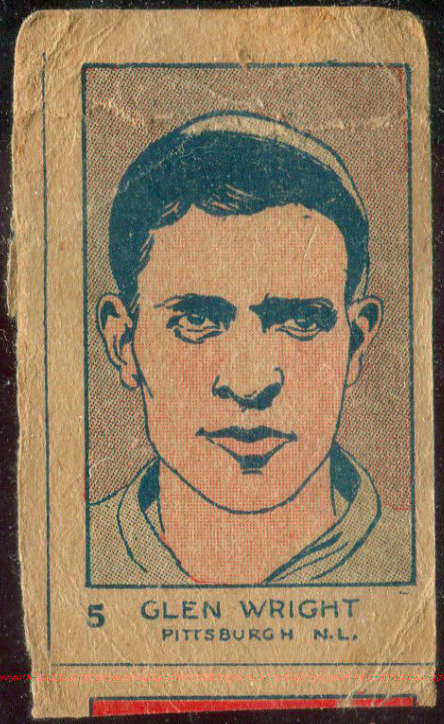 SABR wrote a nice profile for Glenn, starting with his unassisted triple play in 1925. Buckshot earned a minor level of support for the Hall of Fame in the 50s, though eventually dropped off the ballot, probably for lack of overall production. Of all things, a 1929 handball accident ruined his throwing arm and cut his fielding ability from great to average. It's not on the level of some bizarre player injuries, but it's not something you'd expect from a baseballer today. What you see on the card is what you get with the W512s: hand-drawn players, paper strips sold from machines, and fruit-like facial features. The set does have a distinct advantage over others from the 1920s. Its total baseball checklist is ten (10) cards, with names like Cobb, Ruth, Hornsby, and Alexander. If you want to finish an early set full of "legends" for smaller money, this is the one for you. You can even expand into the multi-sport sections, should two handfuls of cards prove unsatisfying. 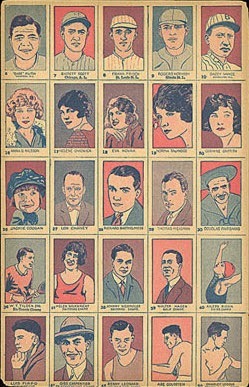 This "lefthand" sheet shows Glenn at one top corner and the "righthand" sheet completes the set of 50. 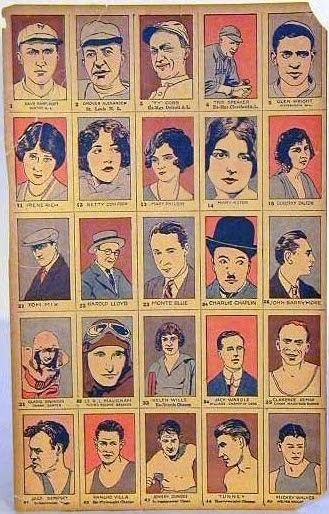 You might recognize Hollywood actors, aviators, and other athletes following the initial 10 baseball players. Speaking of things that derailed a career, former Boston and Seattle shortstop Rey Quinones had my favorite reason not to play every day: he was too good. Value: Low-grade W512 singles cost a few dollars, unless they're one of the big baseball stars or a notable name like Charlie Chaplin or Charles Lindbergh. Fakes / reprints: It'd be easy to fake these, thanks to the crude art and paper stock. Be wary of buying Ruth, Cobb, and other stars without confidence in the dealer.